the link level is not the place for a long amateur radio call, or complicated control and routing mechanisms. This level should just handle data linking in as efficient a way as possible. We believe the dynamically alterable net control station, giving out dynamic addresses, to be the most robust mechanism for surviving network node failures, allowing easy routing through multiple, unique binary ID's existing concurrently. Although the link station always may become the NCS~ reliability is only guaranteed with multiply available links, a point to remember when allowing only one AMICON link per city. a) network sublayer- X.25 is an acceptable standard, but experimentation at this level will not impact operation of AMICON. Both VADCG and TAPR are going to experiment at this level. b) internet level- NBS internet protocol would probably be the most likely candidate for mutual mapping of dissimilar network sublayer protocols. For the interim standard (determining how to make our TNC's talk on the channel) however, I would suggest using naked network sublayer. The TAPR TNC will be able to talk VADCG protocol without modification, and VADCG boards appearing in a TAPR net cause the NCS to go into VADCG digipeater mode automatically. The only problem is to use the least common denominator for digipeater protocol... the VADCG system will probably have smarter digipeaters at all LAN sites at about the same time that We're ready to switch over to the full I.P. on AMICON, so I don't think we have to worry about trying to make the various nets talk the same network sublayer protocol in the future. I suggest we incorporate I.P. as soon as the main LAN sites are ready, and certainly within one year of launch. Paul's suggestions on addressing schemes are very good, and fit within the I.P. standard. I will continue to discuss I.P. with Bob Blanc at NBS~ and with the fellows at SRI who are trying to make the required software fit microprocessors. 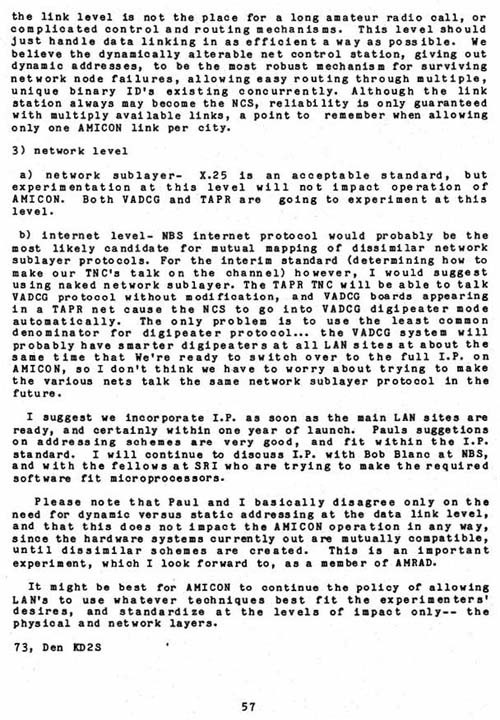 Please note that Paul and I basically disagree only on the need for dynamic versus static addressing at the data link level, and that this does not impact the AMICON operation in any way~ since the hardware systems currently out are mutually compatible, until dissimilar schemes are created. This is an important experiment, which I look forward to, as a member of AMRAD. It might be best for AMICON to continue the policy of allowing LAN's to use whatever techniques best fit the experimenters' desires, and standardize at the levels of impact only-- the physical and network layers.